This dental malpractice claim was filed in St. Mary's County when a dentist extracted the wrong tooth. It was filed in Health Claims Arbitration on January 18, 2018, and it is the 31st medical malpractice case filed in Maryland this year. A man went to his dentist for a consultation about his blackened and broken tooth #6. A dental x-ray showed that tooth #6 had an abscess near the root, and tooth #7 had the beginnings of a cavity. The dentist recommended that the man take Penicillin for a week to resolve the abscess and return to have tooth #6 removed. During the return visit, the dentist administered shots of Novocain in preparation for the tooth extraction. 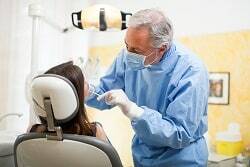 The man reported feeling no pain, even when the dentist began probing tooth #6. The dentist administered additional shots of Novocain anyway, and the man lost all feeling in his mouth and face. For unknown reasons, the dentist extracted tooth #7 instead of tooth #6. After the Novocain wore off, the man discovered that his dentist had also cracked tooth #6 in the process of negligently removing tooth #7. He went to his primary care doctor for a prescription to prevent infection and found a different dentist to remove tooth #6. The man also required dental work to smooth and reshape his jawbone where teeth #6 and #7 had been removed. Since the negligent tooth #7 extraction, the man had been experiencing constant pain at the top of his neck. Apparently, the muscle surrounding his cervical spine had not released since the removal of tooth #7. The man went to physical therapy in an effort to relax the muscle. The negligent tooth extraction has also caused the man significant disfigurement. He claims that his business failed as a direct result of the disfigurement because he was unpresentable to new customers. This is the first claim we have seen where the doctor accused of malpractice is deceased. It is also the first case we have seen where a dental assistant was sued. The patient is acting as his own lawyer. This is a tough play. Still, he wrote out a pretty good 121 paragraph complaint. This claimant is a victim of obvious malpractice, but unfortunately, it is unlikely that his claim will make it past the Health Claims Arbitration Office. Luckily for the claimant, it doesn't seem as though he has suffered permanent physical pain, but few lawyers are willing to take on clients with cosmetic damage only. Without the help of a lawyer, it is challenging to find a qualified expert witness and navigate the demands of health claims dispute resolution in Maryland. Hopefully, the plaintiff knows that he needs an expert to proceed. A dentist and his practice. Failure to extract the correct tooth. Failure to perform a proper extraction procedure without injuring neighboring teeth. The negligent tooth extraction caused the claimant significant pain and disfigurement. Read about other dental malpractice claims involving tooth extractions, including nerve damage and bone infection.